I walked into Utah Repertory Theater Company's space at the Gateway for Carrie: The Musical, and was immediately submersed in a world that felt like a Haunted Gymnasium. The sounds,the lighting, the smells, the "dead" people walking around were all on par. I'm not a big fan of interactive casts when the production wasn't originally designed to be interactive, so I was a little leery until I realized this was not an interactive production, but an immersive one. The "dead" students simply existed to create the atmosphere, which perfectly pulled me into the spell of Carrie: The Musical. Carrie: The Musical, directed by Johnny Hebda, is based off the famous Stephen King novel and subsequent film, Carrie. The plot follows the title character as she matures in high school, as she is bullied relentlessly, as she learns to trust and distrust, as she is abused by her religious zealot of a mother, and as she discovers her powers which ultimately lead to her demise and the demise of almost all of her classmates. Immediately, I was impressed with the strong choral ensemble sound and great acoustics in combination with superbly-executed dance moves. In spite of the fact that the actors are often directly in front of you or surrounding you, the blending is fantastic and, because of the intimate atmosphere, even if an actor's mic wasn't on as quickly as it should have been, you could still hear the actor. Vocally, the strongest numbers for me were anything sung by Rachel Shull as the terrifying Margaret White, "Unsuspecting Hearts" - a duet between Natalia Noble's Carrie White and Megan Shenefelt's Miss Gardner, and "Shine"- a duet between Emilie Starr's Sue Snell and Brock Dalgleish's Tommy Ross. I was impressed with how healthy of a belt sound the leading actors produced with an exception of a few pushed lines on the title song "Carrie." Skye Dahlstrom's sassy, insecure bully, Chris Hargensen, on "The World According to Chris" had a strained, forced sound to her belt, but melted my heart with her crystal clear angelic, gentle sound when singing in her higher register head voice as she introspectively sings alone after the rest of the cast exits the stage. Acting-wise, Dahlstrom is a stand-out in her portrayal of Chris - she shows us the insecurities deep within that manifest into cruelty. We watch all of the character relationships develop throughout the show, but the best relationship chemistry, surprisingly, is at the beginning of the show between "best friends" Sue (Starr) and Chris (Dahlstrom). I also enjoyed the loving, protective relationship between Carrie (Noble) and Miss Gardner (Shenefelt). 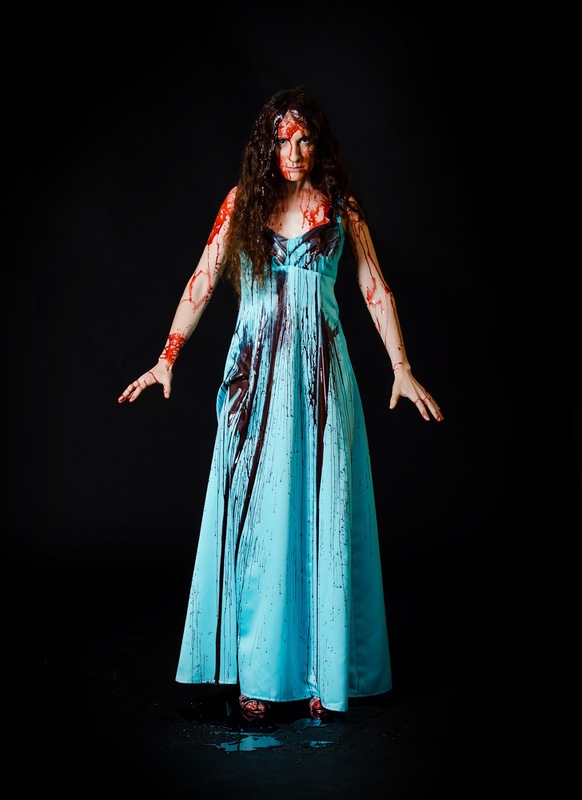 Natalie Noble will absolutely knock your socks off as she becomes Carrie White - from her posture to her mannerisms to her awkward glances to her unsure-come-unstoppable metamorphosis. Margaret (Shull) was truly the most terrifying character in the show, with her religious-zealot mind frame and the way she loves and simultaneously abuses her daughter. My notes actually said, "Shull as Margaret - YIKES!" Miss Gardner (Shenefelt) is Carrie's inspiration in a voice of love and reason. There was a certain melody missing to her southern accent, but nothing can stop the warmth you feel emananting from her and her love for the students. Emilie Eileen Starr's Sue is the heart of this production, covering every emotion from joyous to tearfully traumatized to love to fear to hate - and bringing the audience along with her on the ride. As a whole, the ensemble characters are fantastically convincing in character, never breaking even though at times they are practically on top of the audience. They precisely and energetically execute Ashley Gardner Carlson's ambitious choreography. One female ensemble member lacked the electricity to her character the others portrayed, while none of the male ensemble members convincingly portrayed the heterosexual males they are intended to be (one is written as being "confused). But don't take what I'm saying the wrong way - the ensemble was absolutely at a level at which any director would be more than pleased. To both ensemble and leads - most of the cast has rock-star physiques that the best of trainers would be proud of, so I must point out there is no need to fidget or adjust the costumes while on stage. Speaking of the ensemble, the staging of many of the scenes, full of chaos and running, was precisely portrayed the performance I attended. I can see how one wrong step could lead to a collision or injury, but the cast seemed acutely aware of each other, in spite of darkness, flashing lights, and screaming. The lighting, by Geoffrey Gregory, with precise spots, color changes, creation of the tone for the special effects, etc, was also exactly what I would hope for in a production in this space. The magic of the special effects shared with the audience were spot-on. Many of the effects were implied for the audience to use our imaginations with sound and light, which absolutely worked because the imagination is often times more vivid than reality, yet because the effects we saw were so enthralling, we were left wanting more of the magic show. Also a huge help in creating the atmosphere was the makeup by Kelly Donahue. Characters change from dead to alive at the beginning of the show through the flashback story-telling of Starr's Snell. I was amazed at the quickness of that change. Carrie is a girl who doesn't know how to take care of herself, but I don't see her as absolutely wretched, which is what her harsh makeup at the beginning of the show creates with the red tones on her eyes and flesh tone on her lips. Her color tones were more blended by half-way through Act 1. The aging makeup on Shull worked well, considering the very small venue and how close we were, but I wish I had been twenty feet further away so I wouldn't have noticed. To save the best mention for last - the blood. The Blood! The blood looked real, created gore without being over-the-top, and smelled delicious. Yes, I understand the creepiness of that statement. Very well done. The music was perfection. I didn't realize the orchestrations were live until part-way through the show because they were precisely executed and at such a perfect balance sound-wise with the vocals. Balance may seem a given, but in most shows there is almost always one over-powering the other. Hats off to music director Kevin Mathie. Director Hebda's vision for the show was original and well-executed. Many of the props, as we experience this story through the flashbacks of Sue Snell, were left to the imagination, except vital pieces such as The Bible. In flashbacks, we remember only integral details, not every minute object. The missing pieces added to the atmosphere, creating a disturbing element visually. Hebda's vision also leant itself to leaving out some of the vulgar bullying aspects at the beginning of the show that weren't necessary. He wisely re-imagined the beginning of the show to have the characters first appear as deceased, then a close-up on the living Sue, creating the full-circle of the story. You will also notice that Sue never changes costumes, which makes sense as the audience is experiencing this story through her narration of her memories. She flawlessly transitions from telling the story to being part of the story. There wasn't any better place to be this past Halloween weekend than watching this production. The talent impressed, the atmosphere transported, and the message touched hearts to the point of tears from both audience members and cast alike. If you are intrigued by the idea of Carrie as a musical, go check it out and you will walk away with your heart more full, whether for your love of people or horror. * Carrie is the perfect choice for entertainment to haunt you with the ghosts of your past, as every audience member will be able to connect with one of the characters as someone they knew, or were, in their youth. You can buy tickets for shows Wednesday at 7:30pm - Sunday, November 8 at 7:30pm. There is a 2pm Matinee on Saturday and a 3pm matinee on Sunday. This Wednesday is "pay as you may" day at the door (Gateway Mall, 90 S. Rio Grande St. in Salt Lake City) as long as tickets remain. Prices are $18 for adults pre-purchased, $15 for students/seniors, and $20 for adults at the door. *Content Advisory: This production contains adult language, with several uses of "the F-word." There is also physical violence, although it is purely theatrical, it is staged convincingly. The theatre trend is never been down nor changed. Theatres are actually showing the real entertainment but they focus on a specific market usually. These are the best ringtones for your phone. Are you bored with your ringtone? Want to change the ringtone? We will show you some ring tones in 2018. The best free ringtone you can install for your phone. Looking forward to my ringtone will help you to have the best ringtone for your phone. Thank you!